Low-cost airline Cebu Pacific announces a new seat sale promo wherein they slashed down the base fares of their newest domestic destinations: Masbate and Camiguin. 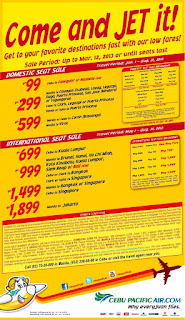 In addition to that, they also gives discounted fares to other domestic and international destinations. Tickets can be purchased online at www.cebupacificair.com or at their ticketing offices. You can also reserve online and pay at their designated payment centers. Please see the complete list of payment centers at Cebu Pacific website. 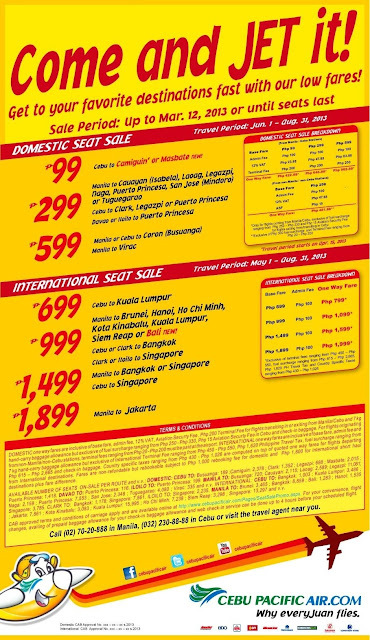 This promo is available for booking until March 12, 2013 or until seats last, whichever comes first. Cebu Pacific is the largest airline in the country and third in Asia as a low-cost airline. It currently flies to 35 domestic and 20 international destinations. Last year, they flew over 13 Million passengers. John Gokongwei Summit (JGS), the parent company of Cebu Pacific have stakes in Food, Beverage, Malls, Hotels and Properties business.